A quiet working space in your garden. A compact and stylish room for a small team. An eco-friendly and completely recyclable office unit. HiLoft is all of these things and more. 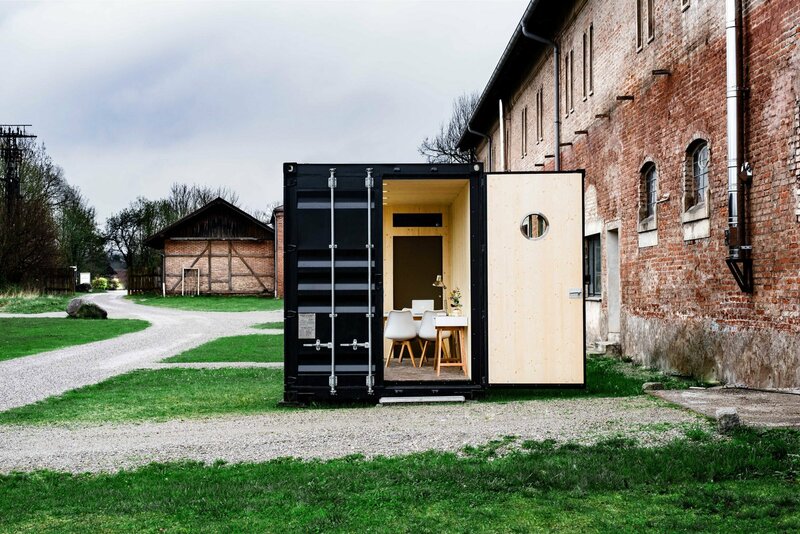 Designed and built in Germany by Diesignwerker, this upscaled shipping container can be rented, purchased, sent almost anywhere in the world, and installed in any outdoor space. Each unit comes with solid wood interior walls and ceilings, large glazed windows with blinds, plush high-pile carpet, air conditioning, ventilation system, LED lighting, and underfloor heating. Available extras include sinks, refrigerators, coffee machines, or furniture, to suit any requirements; the exterior can also be painted in the customer’s preferred color tone or decorated with a company logo. Made from high quality materials, including natural jute used for the insulation, the HiLoft can be conveniently recycled. It offers plenty of space for individuals to use as a permanent home office located in a garden area, with the glazed walls letting natural light inside and creating a relaxed working atmosphere, but it can also be used by smaller teams for meetings on an occasional basis. Read more about the specs or order a unit by going to the official website. Photography by Robert Sakowski.